If you entered Barcelona by sea, like say, on board of a Mediterranean Cruiser or your own boat (stop dreaming! 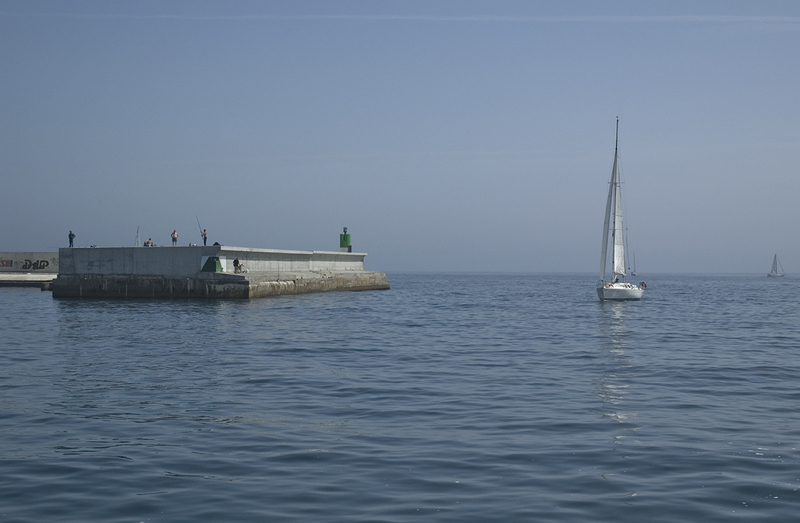 ), you would necessarily have to see this place as it is the mouth of Barcelona Port . A very quiet place, away from the noisy city which can hardly be seen from this point on the blurry horizon if you could look left of course. Those fishermen you see came walking along the long concrete wall looking for a deep place to throw the bait. I have left the harbor for the open seas twice, one going to Menorca on a big ferry at night and the other, this time, onboard of a sightseeing boat. On both occasions the experience has been very pleasing, I mean, there is so much silence out there when you are alone with your own thoughts watching the hypnotizing beauty of the sea, that you all of a sudden rediscover that you are alive, that you are not attached to the city, to that portion of land and bricks, that you are not a number in the stats but a human being only attached to nature, to Mother Earth. Wow, this is a very beautiful image. I wana be there and take some shots. I'm going to be in Barcelona for a day sometime in august. Do you have any suggestions for what I should visit? This is a nice scene and peaceful enough to hear the water lap the shore.